Aldi does a pretty excellent job of serving breakfast in its Regular Buy section alone — from essential components to prepared foods — so when the grocer augments its lineup with ALDI Finds (Special Buys), we tend to stop and take notice. We especially take notice when the ALDI Find in question offers something healthier than the Regular Buy. So when Aldi offered chicken sausage patties — a counterpart to Aldi’s much-beloved pork sausage patties — we had to try them. Breakfast Best Chicken Breakfast Sausages come in a resealable pack in the ALDI Finds frozen section. They’re a limited buy, which means once they’re gone, they’re gone. At the time of this post, they came in both original and maple flavor. We tried the maple flavor. They’re fully cooked, which means that all you need to do to get them ready is to heat and serve. There are two ways to do that, both of which involve cooking directly from frozen. One is by skillet. To do this, simply coat a non-stick skillet with cooking spray, then heat the patties over medium heat, turning frequently, until cooked through. The package indicates this takes about 5 minutes. We used the skillet method. It took a little longer than 5 minutes, but less than 10, and they cooked through about as well as other patties we’ve made. They tasted excellent. They have a decidedly down-on-the-farm taste, with rich flavor. They also have a little bit of kick — not a lot — which we think adds to the flavor … and we’re not generally big into spicy foods. The texture is also mostly good: the meat cuts easily and the amount of gristle is pretty small. The maple flavoring in the ones we tried was subtle but there. Nutritionally, these are … okay. 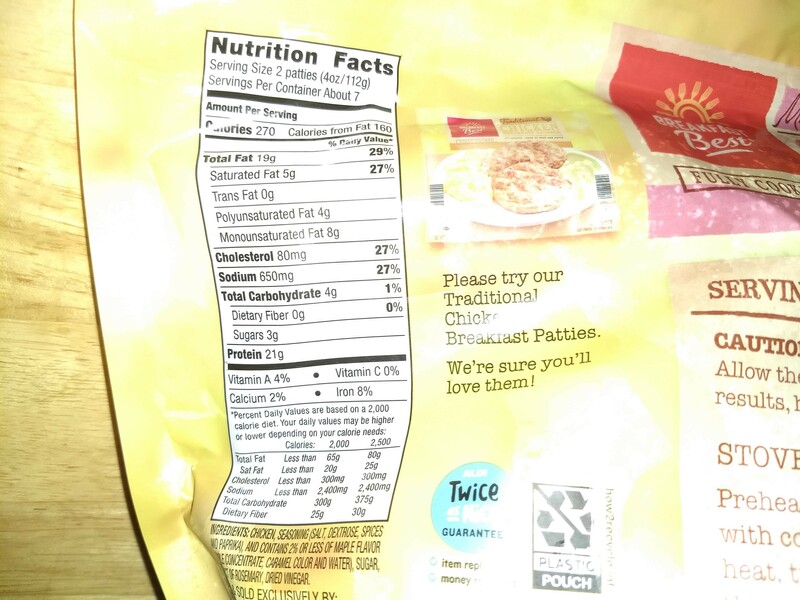 Each patty has about 135 calories, 9 grams of fat (about 14.5% of your daily allowance), 17 milligrams of cholesterol (13.5%), and 140 milligrams of sodium (13.5%). 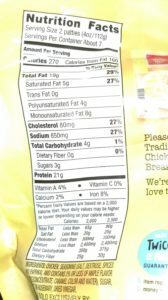 That’s less fat than the sausage patties, but actually a little more cholesterol and sodium, so these aren’t entirely healthier than their pork counterparts. It’s also worth noting that the maple flavoring adds very little, if any, sugars to the overall package. 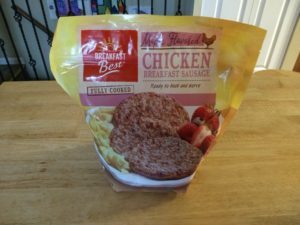 Aldi’s Breakfast Best Chicken Sausage Patties are very good. They’re easy to cook and taste excellent, although they’re not as healthy as you might expect. They’re also limited-run ALDI Finds, so if you want them and you see them, get them while you can.